In his commentary on Colossians, Christopher Seitz, an Old Testament scholar by trade, makes use of a wide array of ancient and modern Christian interpreters to give an irenic, theologically rich, and textually sensitive reading of Paul’s letter. Seitz’s book is part of the Brazos Theological Commentary on the Bible series, which takes as its premise the idea that “the Nicene tradition, in all its diversity and controversy, provides the proper basis for the interpretation of the Bible as Christian scripture” and that “dogma clarifies rather than obscures” (p.11). On a related note, Seitz explains that when one looks at the history of Christian interpretation as a whole, the production of commentaries on single books of the Bible is a relatively recent phenomenon, though of course there are some notable exceptions (p.21). This modern emphasis on the individuality of each of Paul’s letters has had some positive consequences, including greater attention being given to matters like authorship, date, setting, and so on. One of the downsides though, is that these developments have also sometimes lead to “a focus on such matters arguably in disproportion to their significance for their interpretation” (p.22). He sees this especially playing out in the intense emphasis given by many modern treatments of Colossians on the “Colossian heresy” as the main reason for Paul’s writing of the letter, given the actual tone of the letter itself. In light of this, it makes sense that the warnings given in chapter 2 regarding the “Colossian heresy” are of a more general nature. Seitz thinks that they probably don’t correspond to a single religious system actually present on the ground in Colossae vying for the loyalty of the Colossian believers (p.119). Paul is advocating that the Colossians “put on Christ” and not be led astray by any alternative teaching, regardless of its exact origin or specific details. So what is the heart of Paul’s message to the Colossians? I think one could do worse than look at Seitz summary near the end of his section of commentary on Ch. 2:8-23, “We have died in Christ… Our identity is hidden in Christ himself, who is raising us and asking that we put on his own new clothing” (p.143). In the larger world of scholarship, the idea that orthodox Christian doctrine can be an interpretative aid rather than obstacle can be a controversial claim. Many modern historical-critical interpreters have sometimes viewed the history of Christian tradition as a “moldering scrim of antique prejudice,” a distorting lens that must be pushed aside in order to uncover the “original” meaning of the text. (pp.10-11). However, postmodern thinkers like Derrida (among others) have persuasively shown that the use of interpretative frameworks is unavoidable and that complete interpretative objectivity will forever remain an elusive goal. In light of this, it seems interesting to me to see what theological fruits can be found by using the Nicene tradition (a very diverse thing) as an interpretative starting point. 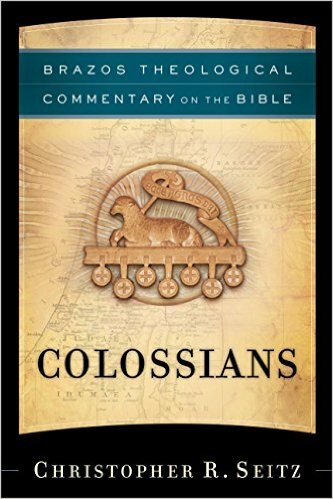 Seitz commentary on Colossians, like the series as a whole, shows this to be a worthwhile project. *Disclosure: I received this book free from Brazos Press for review purposes. The opinions I have expressed are my own, and I was not required to write a positive review. This entry was posted in Book Reviews and tagged Book Reviews, Canonical Reading, Christopher Seitz, Colossians, Commentaries, Paul, theology by joecrow91. Bookmark the permalink.